Seeing as how I'm the resident wine expert here, having worked as a wine rep* for a whole two months now, I thought I'd do a little food and wine pairing column, perhaps on a regular basis. * If you want to know about me and my company, just click on my bio. Wine and food go hand in hand, they always have. According to Wikipedia, which we know is always so super reliable (they did change Brittany Murphy's profile about ten minutes after she passed), evidence suggests that the earliest wine production took place in the Mid East around 6000 BC, and winemaking in Europe dates back 6,500 years. And, well...people ate back then too! Coincidence? I think not. Well, regardless, I dare you to eat a hearty lasagna and not long for a nice Italian Chianti, or a sausage and seafood-filled paella and not wish you were sipping on a quality tempranillo from Spain. Ok so, new world wines might lack the history and pedigree enjoyed by those wines from the old country, but they can exhibit some of the greatest flavor profiles, rivaling their European predecessors. For example, Pinot Noir is not just a Burgundy grape; some of the absolute best pinots hail from the Pacific Northwest and Down Under. Directions Put the lamb in a shallow, non-reactive dish. Mix garlic, yogurt, cumin, cinnamon, turmeric, ginger and chilies. Spread mixture over lamb, cover with plastic wrap and marinate for minimum two hours. Put the couscous, salt and 2 tablespoons of the olive oil into a heatproof bowl, mix well, and add enough boiling water to just cover the couscous. Quickly cover the bowl with foil and leave for 20 minutes. Fluff the grains with a fork to break up any lumps. Cool until warm and then add remaining ingredients, including the remaining 4 tablespoons of olive oil. Season well with salt and pepper. Panfry or barbecue the lamb over high heat, about 3-4 minutes on each side for medium. Remove from heat and let rest 4 minutes before slicing thin. Serve on the couscous salad with lemon wedges. 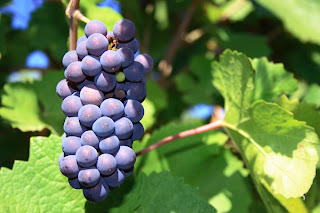 To read more about wine, specifically the wines and wineries of Napa & Sonoma Valleys, click here for SashaInTheKitchen's travel wine review. Click here for Christina's article on chicken prepared using red wine in Budapest. Lamb is one of the roundtable features of the month at Akitcheninbrooklyn. Click here for SashaInTheKitchen's braised lamb ancho chile tacos and rack of lamb with fresh herbs.